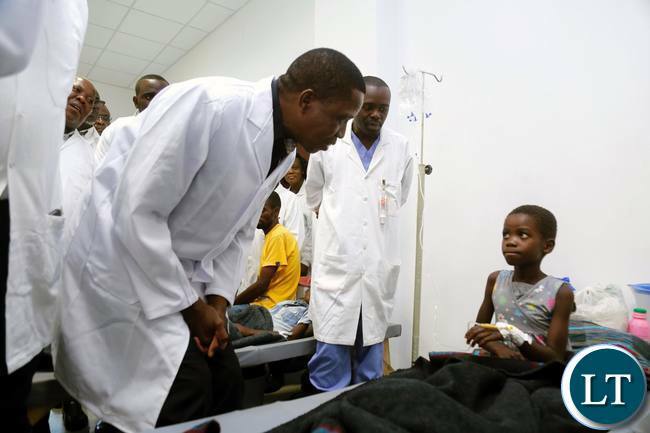 Lusaka Deputy Mayor Chilando Chitangala says the drastic drop in the number of people dying from cholera to zero this year from the high of 100 last year is directly linked to President Edgar Lungu’s vicious drive to clean up the city of Lusaka recently. The Deputy Mayor of Lusaka made the remarks in Berlin when a group of Civic and private sector top officials paid a courtesy call on Zambia’s Ambassador to Germany Anthony Mukwita at the embassy’s Axel Springer premises. She said pictures of President Lungu casting aside his elegant suits to don working clothes and boots to get his hands dirty in order save lives and keep the city clean remain vivid on the minds of many Zambians and beyond to this day. Ms. Chitangala said the Zambian military and other government organizations followed the Presidential cue and escalated the keep Lusaka clean campaign like no other time. Others are Mr. Peter Chilambwe, Assistant Secretary, Lusaka Provincial Administration, Mr. Laurian Haangala, Director for Zambia Chamber of Commerce and Industry, Mr. Jonathan Kampata, Managing Director, Lusaka Water and Sewerage Company and Mr. Ezekiel Sekele, Corporate Affairs Director, Zambian Breweries. This is according to a statement issued to the media by First Secretary for Press at the Zambian Embassy in Berlin German Kellys Kaunda. Really?? Your friend Kagame is being praised for bringing Manufacturers like VW to the country, Magufuli for cutting government wasted expenditure, then our Great Leader ati for bringing down Cholera deaths. Dear God in heaven, please give Zambians the wisdom to remove the PF in 2021. We pray in Jesus name, Amen. Truly indeed Edgar and Eric Chimese started that cholera clean up campaign. It costed Eric a job because media praised Eric more than Edgar. This article is good but a little too late. No need to be patting each other on the backs here … even one life lost is way too many. The strategy should be total annulation of such a scourge among the smart people of the Zambian Enterprise. That’s how we run this country … Let’s roll!!! He wore gloves and protective clothes which the people who do this 24/7 cannot afford to have. They do not even have ‘elegant suits’ to put off. They work in the same clothes they live in. Stop patronising people, please. I have never seen people working so hard to vuvuzela their appointing officer as these Zambian PF bootlickers do since our independence nearly 55 years ago! Let the works speak for themselves! That’s like being praised for failing your exams less from grade F to now having a grade D minus.Lungu is still subpar on many levels. Cleaning lusaka is the job of lusaka city council and not central govt. Deputy mayor praising the president for something she should have done. I wonder what she thinks her job is. What exactly does she want to do for lusaka in her position as deputy mayor. Good point, I think it is because they have nothing positive to sing about so will latch on any good news. Job well done Mr. President. Stuupid idyooote……that lungu spent $17 billion and 100 people still died ?? He should be in the docks for those 100 deaths….corrupt theif. This is called the messiah complex. It is a mental disorder. Sean Tembo has enough evidence to show the courts what he perceived to be the current state of mind of our dear comrade brother leader of zamunda kingdom. Very sad indeed…Surely is this a deputy mayor for our capital city?